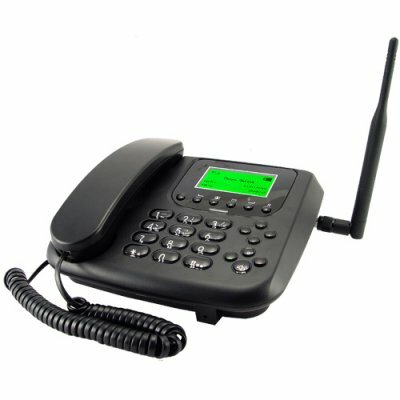 Successfully Added Executive GSM Business Desk Phone - US Edition to your Shopping Cart. Executive GSM business desk phone for people who enjoy having the standard look an feel of a regular land line telephone with some of the functionality of the modern mobile phone. This is a Wireless GSM business phone that offers practical cellphone features, and comes in a design of the traditional standard looking desk phone. This is definitely a cool gadget to have, especially if you have more than one SIM card, or just like the look and feel of the traditional desk phone. This GSM desk phone offers a range of practical features that we find in today's cell phones such as text messaging and phone book organizer. The large keys make it ever so easy to text with accurate speed, along with its navigational menu design that resembles that of a modern cellular phone. This GSM desk phone comes with a variety of menu languages. In addition, the GSM desk phone comes with a rechargeable Li-ion battery, meaning you can use it in any room in the house, e.g. patio, conservatory, bathroom... etc. This phone makes it simple to be more productive while sitting at your desk. This is a dual band GSM phone that accepts a standard GSM SIM card, and is very easy to setup and ready to use straight out of the box. This GSM executive desk phone is the perfect phone for people who always work from their desk, and if your not into the modern small form factor cell phones, then this is the perfect way to stay connected, without having to pay monthly land line charges. This GSM desk phone is in stock now and available for single piece or stock orders straight to you from the leader in direct wholesale electronics, Chinavasion. Simple navigation menu with high quality built in speaker and MIC for hands free talking. NOTE: This product is compatible with the worldwide standard GSM frequencies of 850MHz and 1900MHz. Please check with your local provider if you are unsure of your local band requirement. THIS PHONE WILL NOT WORK IN EUROPE. Please order CVFK-M14-EU if you need a 900/1800MHz dual band version. In countries where having a fixed land line is either an expensive option or network infrastructure does not exist, the GSM desk phone can provide fixed line functionality over the GSM network. Does the CVFK-M14 also have voice mail functionality? Yes, you can receive voice mail, just in case you're away from your desk. Can this GSM desk phone work in the U.S.? Yes, this GSM desktop style cell phone will work in the US, Canada, Mexico, and other North and South American countries that use use the GSM frequencies of 850MHz and 1900MHz. how to program the "1" key to dial AT&T's voicemail access line. This phone is easy to use, sleek in design and very practical for those of us that like a desk style phone but use cellular networks in place of landlines. The external antenna enables me to get a much better signal than my regular cellular phone, so if you have trouble getting a signal at home or in the office normally, you get better reception with this unit.